Experience the beauty and culture of Arizona at this unique Tucson hotel Enjoy a full hot breakfast served daily at Royal Sun Restaurant. In the evening, enjoy a 2-for-1 drinks special at the Lounge. Our guests enjoy sitting around our fish pond or in the pool area surfing the web. Complimentary wired & wireless High Speed Internet Access is available for your comfort.A great Tucson hotel where customer service is a first priority. The Best Western Royal Sun is an Arizona resort style hotel located just seven miles from Tucson International Airport, less then a mile from Downtown (Govt. offices), near the Tucson Convention Center, the University of Arizona and all major hospitals (University Medical Center-UMC, Tucson Medical Center-TMC, St. Mary's Hospital, Tucson Heart Hospital). For sports enthusiasts, award-winning golf courses are located nearby. When visiting Arizona for Cactus League baseball every spring, be sure to stay with us - a perfect Spring Training hotel in Tucson We are located very close to 3 malls - Tucson Mall, El Con Mall & Park Place Mall.Offering all of the features and amenities that business and leisure travelers expect, our luxuriously landscaped hotel is a vacation oasis. Our Business class king mini Suites comes with an oversized desk & a leather chair are very popular among corporate travelers. 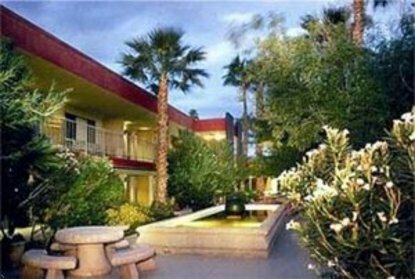 The Best Western Royal Sun offers bed and breakfast style accommodations in the heart of Tucson, Arizona. Our 79 beautifully appointed oversized guest rooms and 20 luxurious suites with Jacuzzi tubs offer comfortable beds, a wide range of amenities including a DVD player & a lighted vanity mirror in a relaxing resort setting. Enjoy our complete fitness center, free high-speed wired & wireless Internet access and be sure to take advantage of our specials and packages.Make a reservation today at the Best Western Royal Sun in - A Resort Style hotel in Tucson, Arizona.